Austin Mathews delivers a pitch for Miami Trace during a Frontier Athletic Conference game against the Washington Blue Lions Friday, April 12, 2019 at Miami Trace High School. Mathews authored a complete game, three-hit shutout for the Panthers. Washington Blue Lion shortstop Karson Runk, left, tries to keep Miami Trace’s Cody Brightman close to second base during the Fayette County rivalry baseball game at Miami Trace High School Friday, April 12, 2019. 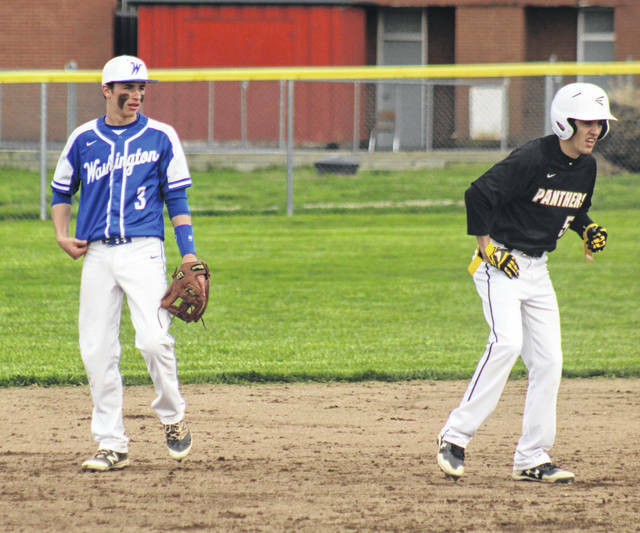 The Washington Blue Lions varsity baseball team played a Frontier Athletic Conference game at Miami Trace High School Friday evening. The game marked the end of the first round of conference play. The Panthers scored twice in the fourth inning and held on for a 2-0 win. Austin Mathews pitched a complete game for the Panthers, yielding three hits. He struck out nine and walked two. He also hit two batters. Jarred Hall started and pitched 4.1 innings for the Blue Lions. He allowed six hits and two runs (neither earned) with four strikeouts and one walk. Bailey Roberts pitched 1.2 innings for the Blue Lions. His pitching line was all zeros. 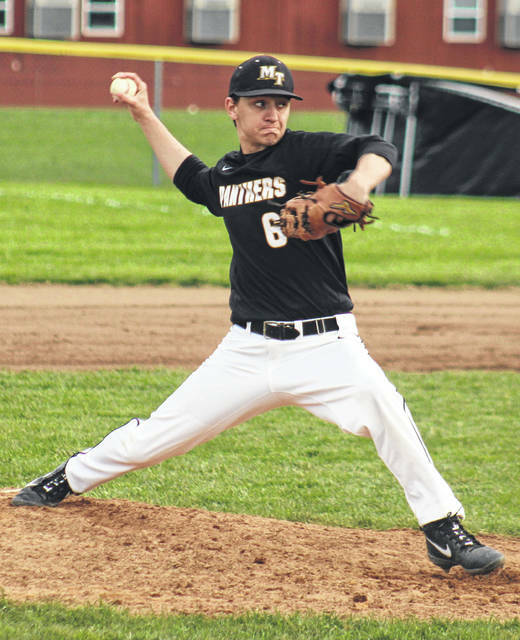 “Austin Mathews pitched a great game,” Miami Trace head coach Rob Smith said. “It was another league shutout. We needed that, because we’re still not scoring runs. “He got out of a couple of bases loaded situations,” Smith said. “It’s a good win against our county rivals. I watched (the Blue Lions) last night (against Adena). They’re a pretty good baseball team. Kind of like us, in that they’ve played some good games and just haven’t had results. “Right now both teams are very similar, offensively,” Smith said. “They got a good pitching performance tonight and we got a great pitching performance. “It’s just great to get a win,” Smith said. “We’ve played well all week, but haven’t had the results to show for it. Every game, it was just one break here or there. We went 1-3 this week. That’s where we’re at right now, because we’re not producing. In the fourth for the Panthers, the first batter was retired. Austin Brown then hit a single to right field. Dalton Mayer reached on an error with Brown advancing to third. Mayer went to second on the play. With two away, Mason Snow singled to right, scoring Brown with what turned out to be the game-winning run. Jacob Hoppes reached on an error that allowed Mayer to score to make it 2-0. The Blue Lions loaded the bases with no out in the top of the third, but Mathews then got a strikeout, a fly out and another strikeout to strand three. Washington loaded the bases again in the sixth, this time with two outs, but again were turned aside. “That was two good pitchers going at it tonight,” Washington head coach Mark Schwartz said. “Hats off to Austin Mathews. He threw a really good game. “I thought Jarred Hall for us pitched a great game,” Schwartz said. “His curve ball was working and he was hitting his spots. He had Miami Trace off-balance for a good portion of the game. We just made a couple of mistakes behind him and Miami Trace capitalized on it. “When we were given the opportunity to score some runs, we just didn’t capitalize,” Schwartz said. “We couldn’t get a hit when we needed it. The Blue Lions (1-10 overall, 0-5 FAC) are back in action Monday at Hillsboro at 5 p.m.
Miami Trace (6-4 overall, 2-3 FAC) returns to the diamond Monday at home, taking on Chillicothe at 5 p.m.
Miami Trace lost Thursday to Westfall, 5-4 when the Mustangs scored in the bottom of the seventh. Offensively for Miami Trace: Josh Gilmore, 1-2, 1 bb, sb; Drew Batson, 1-3, sb; Cody Brightman, 1-3, 2b; Conner Bucher, 1-3, sb; Austin Brown, 1-3, 1 run; Dalton Mayer, 0-3, 1 run, roe; Austin Mathews, 0-3; Mason Snow, 1-3, 1 rbi, sb; Jacob Hoppes, 0-3, roe. LOB: 7. Offensively for Washington: George Reno, 1-4; Karson Runk, 0-4; Jarred Hall, 0-3; Tyler Rood, 1-3; Bailey Roberts, 0-1, 2 hbp; Owen Mullins, 0-0; Ryan Schwartz, 1-3; Eli Shaw, 0-2, 1 bb; Cortez O’Flaherty, 0-2, 1 bb; Brock Morris, 0-0; Tyler Tackage, 0-3. LOB: 8.